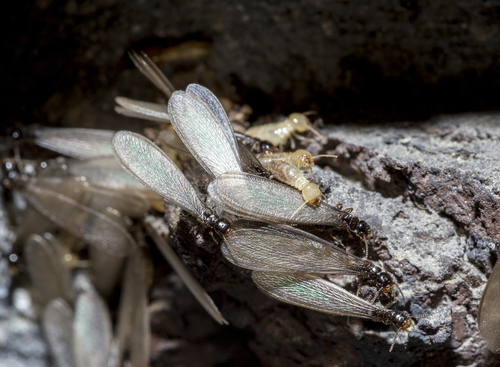 Throughout specific times of the year (typically Spring), termite colonies produce “swarmers” – these are really just winged adult termites that fly away to form their own colonies. The process of Swarming usually occurs during the daytime. 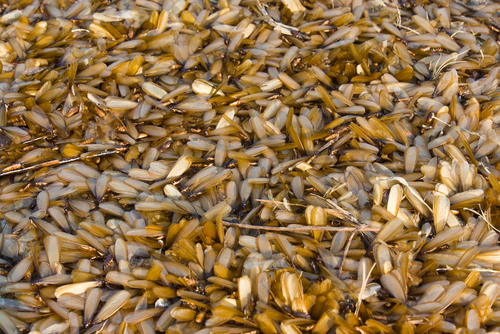 Connecticut termite swarms are often seen on warm days in the spring just after rain. Where did the swarmers come from? The swarming termites likely came from an underground nest, possibly somewhere in your yard, near an old tree stump or close to landscape timbers. WARNING – If you find swarmers indoors, then you quite likely have an infestation under/in your home or business. Will killing the swarmers fix the problem? No. Termite swarmers are a nuisance particularly when swarms occur inside. However, they do not cause structural damage. Protecting your home or business from termites requires a proper soil treatment with a liquid insecticide or the installation of a baiting system (see video below). What should I do if I find termites swarming? The first thing you need to do is confirm that you indeed have termites. Here at Millette Pest Control we offer FREE estimates with inspections. We are also Certified Sentricon Specialists. (Watch the video below to learn more about the Sentricon System).